Want an easy and inexpensive way to install a 22.5 Ø device in 30.5 Ø cutout? This is it. Use economical Altech 22mm switches to replace AB and other manufacturers' 30mm switches. No cutting or modification. 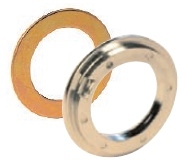 Just insert washer and adapter ring into existing cutout. Kit includes one adapter ring and one washer.